If you missed the great Charles James exhibit at the Metropolitan Museum’s Costume Institute, at least you won’t have to wait till next spring for a new fashion-related show. For the first time in seven years, the Costume Institute will do a fall show: “Death Becomes Her: A Century of Mourning Attire,” will run from October 21 through Feb. 1. 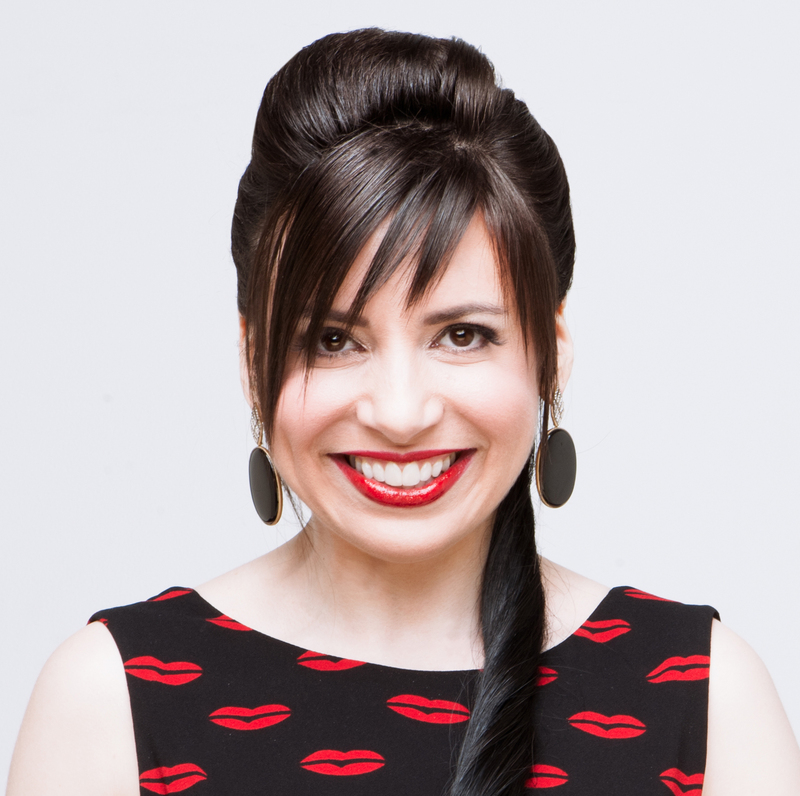 I’m very excited by this theme because my 18K gold jewelry line started with an interest in mourning jewelry, in addition to the more familiar memento mori jewelry. They’re not the same thing. Although “memento mori” is Latin for “remember you will die,” that category of jewelry refers to mortality in general, while mourning jewelry pays tribute to a specific individual. 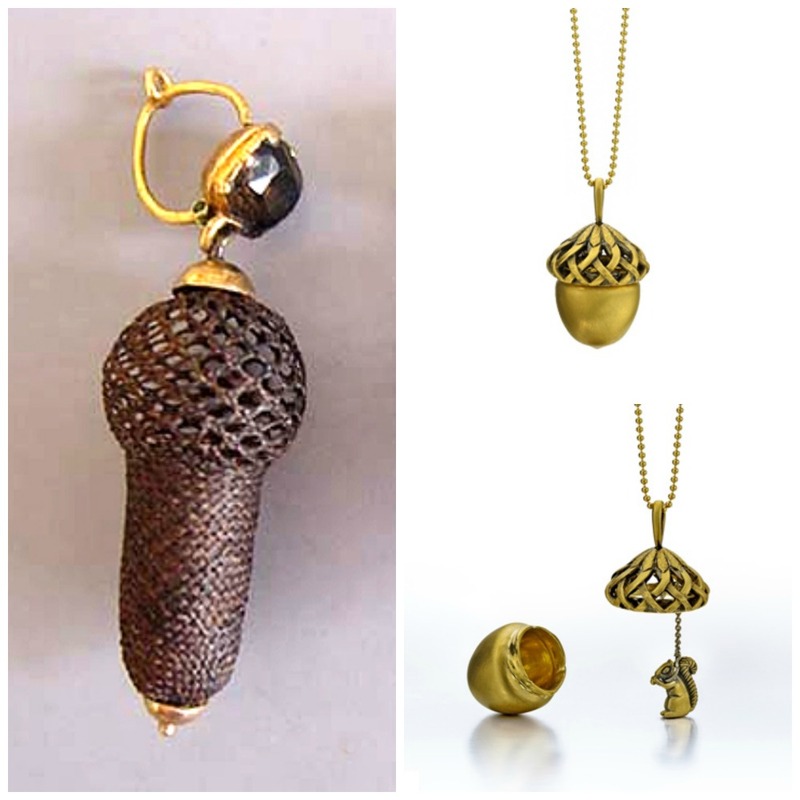 On the left, a Victorian acorn earring, woven from hair. On the right, two views of my acorn locket: closed on top, open on bottom. The source of my locket design caused me some amusement years later when a large catalog company knocked off my necklace. When I called to confront them, they at first tried to argue that the similarity was coincidence. I asked, “How did you get the idea for the woven look of the acorn cap?” The dude in charge was like, “Um ….” “Have you heard of Victorian hair jewelry?” I asked. The answer was no, of course, and the copy was pulled from the catalog. 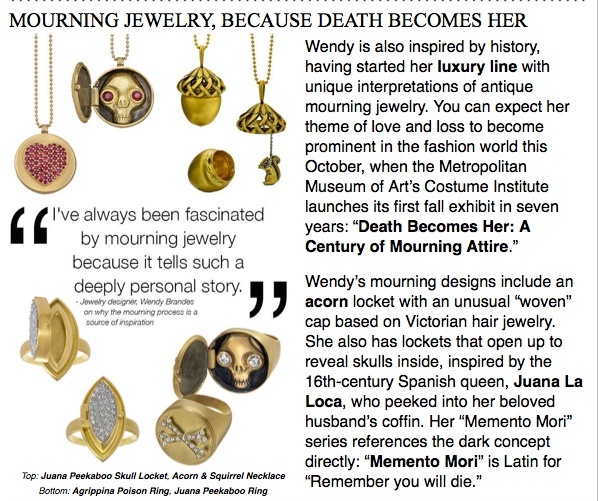 There are a few more examples of my mourning-inspired jewelry in this portion of the monthly newsletter I sent to press and retailers last Tuesday. Lockets were a very big thing because you could put hair or an image of the deceased inside. One ring that didn’t make it into the newsletter was my Victoria buckle ring, which was inspired by a particular antique mourning ring that opened to reveal a name inscribed inside. 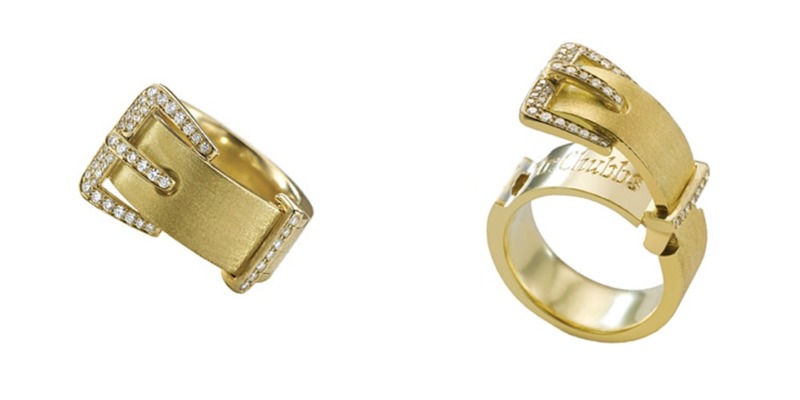 My 18K gold and diamond Victoria buckle ring, shown open and closed. Click to purchase. I made this ring in 2006 for the original purpose — as symbol of mourning for my late Pekingese, Mr. Chubbs. In the photo above, you can see his name inscribed. 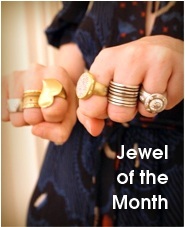 This particular ring went on to have some interesting adventures, courtesy of Lindsay Lohan. Click here and scroll down to read that story. And click here for National Jeweler’s brief story about the coming Met exhibit. 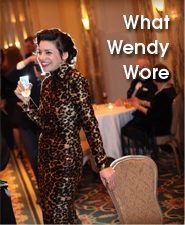 If you’re a member of the press or a retailer who would like to receive the monthly newsletter, email your request to info at wendy brandes dot com. I remember the acorn knock off. Idiots! I should bring my Victorian hair locket with me next time so you can see it. oh yay – I’ll be there in late October. Greenwich Village Halloween parade, and the Costume Institute. Coincidence?? Perfect! I hope to see you!